Spanish cooking reflects the country's status as a Mediterranean country, however it also draws influences from other sources; chief among these is Spain's Jewish and Moorish heritage (much of Spain was occupied and ruled over by the Moors for hundreds of years). Additionally, beginning in the 16th century, Spain conquered a large overseas empire, especially in New World, and as a result, many foods that are not Spanish staples have origins in the Americas: tomatoes, potatoes, beans and peppers. Spain produces nearly half of the world's supply of olives, and as a result, olive oil plays an important part in Spanish cuisine. Even so, in the North of Spain, lard and butter are used when cooking. Other typically Spanish ingredients include garlic and onions, both of which are used extensively. 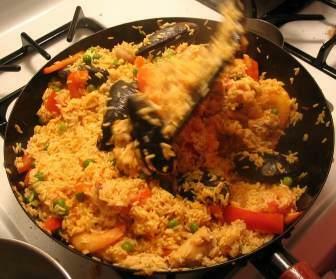 Paella - Paella is a saffron-flavored rice dish that originally came from Valencia. As well as rice, the dish also includes olive oil, and is garnished with meat, seafood and vegetables. Chorizo - This is spicy sausage made from fatty pork. Chorizo is made in two varieties: hot ("picante"), which is seasoned with chili and paprika, and sweet ("dulce"). Generally speaking, most chorizo can be eaten cold, although it is sometimes used as an ingredient in other cooked dishes, but be aware that there are also some types chorizo which require cooking before consumption. Gazpacho - Gazpacho is a classic Spanish soup, served cold, and made from vegetables. Traditionally gazpacho soup was made using stale bread with garlic, olive oil, salt and vinegar, but nowadays other vegetables, particularly tomatoes and bell pepper, are often added. Gazpacho manchego - this is a variant of Gazpacho that is more of a stew than a soup, and which is served warm. Gazpacho manchego also includes additional ingredients: meat (usually rabbit) and mushrooms. Marmitako - This dish is a fish stew. As well as fish, it includes onions, potatoes, tomatoes and pimentos. Fabada Asturiana - This is a stew made from beans, flavored with saffron and other seasonings. As well as beans, the dish also includes chorizo, black blood sausage ("morcilla") and pork. Olla Podrida - Another stew dish. Olla Podrida is made using bacon, ham, meats, and poultry or game, as well as vegetables. 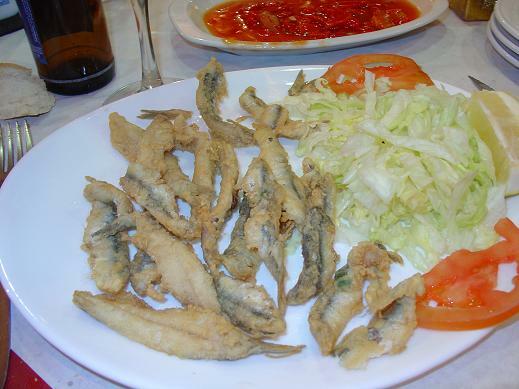 Pescaíto Frito - Fish, cooked in marinated batter. Calamares - Squid fried in batter. Tortilla de patatas - A Spanish omelette: made using eggs, potatoes and onions. As well as the dishes themselves, there is also a Spanish style for how food is consumed. One aspect of this is tapas, in which many small appetizers are served with dranks. Another is the serving of bread and wine with most meals. Bringing together authentic recipes from Italy, Greece, Provence, northern Africa, and the Middle East, DK's Mediterranean Cookbook gives cooks the necessary tools to recreate the flavors of the Mediterranean in their own homes. Fresh, healthy, and easy to make, the Mediterranean Cookbook contains more than 300 recipes, from Citrus Lamb Tagine and Leek Moussaka to Panzanella and Tzatziki. Whether it's the food of Tuscany, Provence, the Greek Islands, Morocco, or Spain, DK's Mediterranean Cookbook is a wonderful resource for families that want to eat fresh, fast, and healthy.